Light sources in each of these categories may be a valuable resource to you when you get left in the dark and need light. Some are more sustainable than others. The power outage may last a few hours or several months. Are you ready to light your world regardless of the status of the electric grid? Let’s review your available options. Start by evaluating exactly what your lighting needs are. Think about the various ways that you may need light as you complete your daily tasks. Each light is intended to serve a unique purpose. 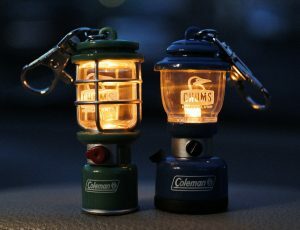 For instance: a headlamp provides great hands-free light, but a lantern would work better to provide area lighting around a table. The soft glow of the fireplace may be all the light that is needed, or perhaps you need bright light for a detailed task. Some situations may be better served with a flame-less lighting option. An open flame can be dangerous, especially around young children. If there is any possibility of a gas leak, an open flame could be deadly. If you are sheltering-in-place in a sealed room an open flame would consume valuable oxygen. Plan appropriate light sources for each scenario you may experience. Consider short-term solutions for brief power outages and plan more sustainable options in the event of an extended power outage. Bright battery powered flashlights will quickly consume valuable batteries while solar flashlights may be recharged over and over again. Careful planning ahead will enable you to light your world even when the rest of the world goes dark. Light intensity is measured in lumens, the higher the lumen rating the brighter the light. This little table will give you an idea of how bright a few of the common light sources are and assist you in your planning. LED bulbs are an incredible way to use very little energy still produce a very bright light. Light Emitting Diode (LED) bulbs will far outperform standard bulbs in both energy performance and bulb life. They do not get hot and do not have a filament to burn out. They will last literally thousands of hours longer than the incandescent bulbs. LED bulbs will far outperform standard bulbs in both energy performance and bulb life. Take advantage of this advancement in technology and replace your old flashlights. You will save a lot of money by using fewer batteries and not having to replace the bulbs. Just because the power is out doesn’t mean you can’t take advantage of stored electricity. Batteries store electricity for future use. They can be used in a variety of lighting devices. Power failure lights are designed to be charged and ready to go whenever the power fails. Portable electric light sources are highly valuable during a disaster. Battery-powered lights are a safe and effective option to meet most lighting needs. Batteries store well in a cool, dry place at room temperature. Batteries do not need to be stored in the refrigerator. Although heat will shorten the shelf life of batteries. Store batteries separate from the lighting device if you do not plan to use it regularly. The battery shelf life should be listed on the package. Alkaline batteries will last 5-10 years when stored appropriately. Lithium batteries last longer, about 10-15 years. We find it easy to rotate through our battery stockpile and keep supplies fresh. We have handy nightlights in our hallway that are actually a small rechargeable flashlight. These clever units plug into the wall and keep the small flashlight charged and handy when needed. When the power goes out, the flashlight goes on instantly to provide a safelight. Our power failure nightlights are equipped with a motion sensor that I love. When one of the kids gets up in the night, the light turns on and alerts me to the fact that someone is up and about. A package of power failure LED nightlights is definitely worth the investment for emergency lighting. Click here to see current pricing on these lights. When the lights go out, the first thought is to reach for a good flashlight with fresh batteries. Flashlights provide a quick, reliable source of light and are available in a wide variety of shapes and sizes. Purchase quality and the flashlight will serve you well for many years. There is a place for cheap dollar store flashlights, but I would stick with high quality for lighting devices that will be dependable in an emergency. Name brands, such as Maglite, are made of quality materials which can be depended upon for many years. They cost more, but a light is a critical resource and worth the investment. One reasonably priced flashlight that I have found is the YIFENG XML-T6 Tactical Flashlight. It has a 1000 lumen LED bulb and takes 3 AAA batteries. It is tough (made from aircraft grade alloy), water resistant, has 5 light modes and a zoom function. Click here to check the current price. Jonathan would be lost in the dark without his headlamp. LED headlamps, or headlights, are highly efficient task lights. They are worn around the head and direct the light source to follow your field of vision. Many headlamps can be adjusted to create different lighting effects; area, spot, strobe or flood light and even a red night vision light. PETZL Tikkina Headlamp is a nice inexpensive choice that has an 80 lumen light and uses 3 AAA batteries. PETZL – TACTIKKA Headlamp may cost a bit more, but has a bright 350 lumens light and can run up to 160 hours on one charge. It has a core rechargeable battery or can be powered by 3 AAA batteries. Small clip headlamps can be clipped on almost any type of hat. Naturehike makes a great Ultra Bright Mini Hands-Free LED Clip-on Hat Light. It is rechargeable, 150 lumens, and waterproof. A single charge will last for up to 48 hours. Rival Gear makes a rechargeable headlamp that is also a clip on flashlight torch. It is 100 lumens and will last 2.5 hours on high and 10 hours on low. The Naturehike headlamp has significantly better battery life. It is important to compare products before purchasing. Most headlamps operate using very little energy due to the efficient LED bulbs. Carefully compare models to ensure you understand the limitations of your headlamp. Battery powered lanterns are designed to provide area lighting. Sizes range from personal to family size. They vary greatly in intensity and efficiency, so shop wisely. Etekcity makes a great portable LED Camping Lantern Flashlight that produces 60 lumens of light using 3 AA batteries for up to 12 hours. Tough Light manufactures a rechargeable LED Lantern that will produce which will produce 200 hours of light at 40 lumens, 75 hours at 162 lumens, 24 hours at 400 super bright lumens all from a single charge. It is rugged and waterproof. 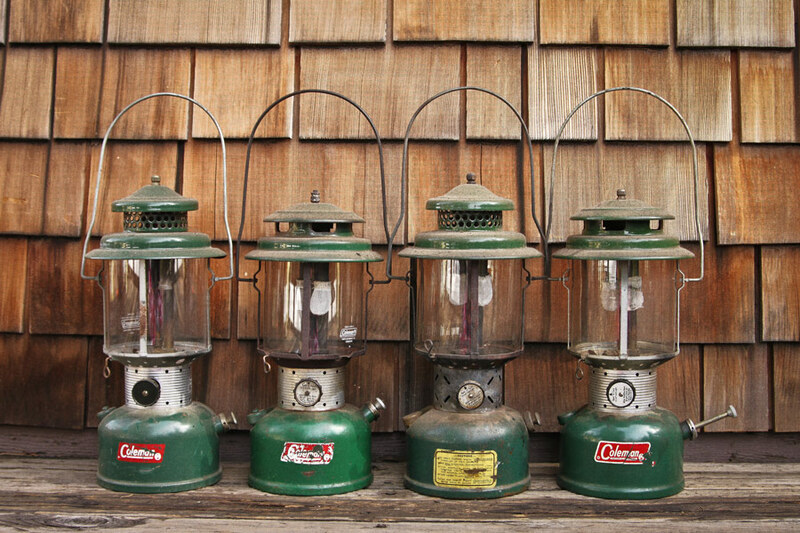 As you can see, there are many good battery-powered lantern options available. 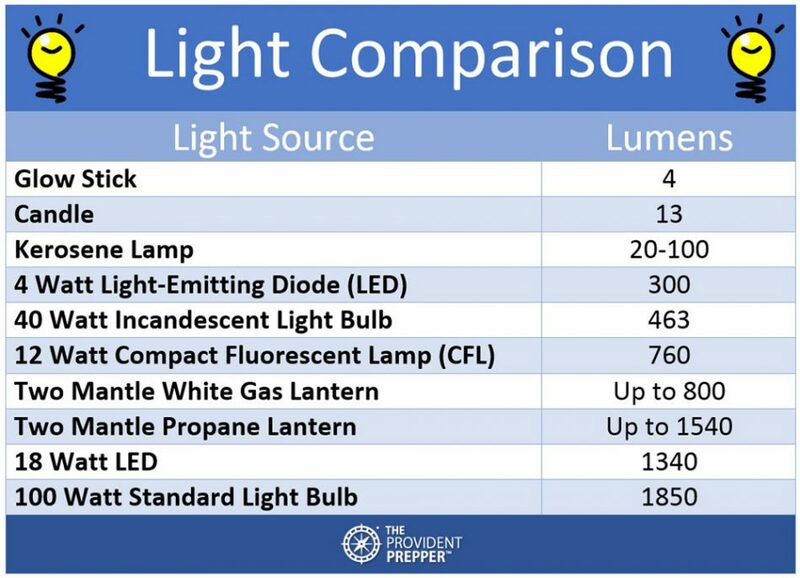 Be sure to check the lumens produced by the lantern and how quickly the lantern will use up the batteries to produce that light. Energy conservation is an important consideration in providing light. Do not use the energy to light an entire room if you only require a little bit of personal lighting. 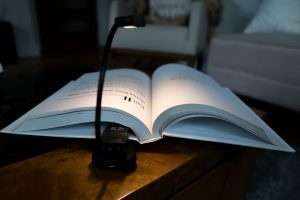 Small clip-on book lights may provide enough light for reading or small tasks. Gimars sells a stick-on LED push light that produces 27 lumens of light from 3 AAA batteries. Batteries will last up to 100 hours. Beam n Read created a 6 LED hands-free task light that hangs around your neck. It will produce about 50 lumens from 4 AA batteries for up to 100 hours. Understand the limitations and performance requirements of each light and plan accordingly. Chemical light sticks are a popular treat at nighttime gatherings. They are a short-term, disposable light source. Quality varies greatly. We give our grandchildren a little glow stick when they spend the night. It adds a little bit of excitement to the adventure and gives them enough light to see in a new environment. 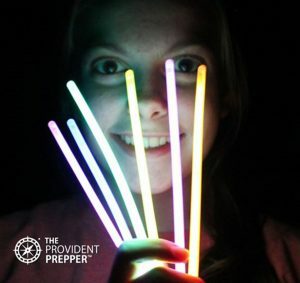 Providing glow sticks for children during a stressful emergency will provide a great deal of comfort. The Cyalume plastic light sticks (glow sticks) come in a variety of shapes and sizes. Generally, the sticks are 4 to 8 inches in length. Hydrogen peroxide fills an inner glass inner tube. When broken, the hydrogen peroxide mixes with dye and diphenyl oxalate inside the plastic tube creating a chemical reaction that creates light. I store a wide variety of light sticks and we have fun with them all the time. I don’t have to worry about the shelf life because we use up our stock every year or two. Light sticks have a shelf life of 4-5 years. Older sticks will not be as bright or last as long as fresh ones. Activating the stick is easy, simply bend it hard enough to break the glass tube inside and shake to mix the chemicals. Once it has been broken there is no turning back. Depending on the brand, it will provide a soft colored light for 6 to 12 hours. It is windproof, weatherproof, does not create sparks, and is safe for all ages. We love using solar products whenever possible. The technology has advanced and there are incredible, sustainable light sources available. The risk associated with open flame and carbon monoxide poisoning is eliminated when using solar powered light sources. The sun’s energy is renewable, free and readily available. Solar devices capture the sun’s energy and turn it into electrical energy. This power is usually stored in a battery until ready to be used. We recognize the wisdom in having other light sources available, but we like to harvest as much power from the sun as we realistically can. We keep our solar devices in a south facing window to be sure that they are charged and ready to go at a moment’s notice. There are a variety of solar-powered lanterns available. Depending on the particular design you may be able to charge the lantern using a hand crank, auto adapter, a UL listed house adapter or standard batteries in addition to sunlight. TANSOREN makes a Rechargeable Weatherproof Emergency Solar Lantern which will produce 60 lumens for up to 8 hours on one charge or 3 AA rechargeable batteries. We have a couple of inexpensive solar lanterns and one higher quality lantern. They have survived the abuse of family camping along with enthusiastic (and unintentionally highly destructive) small grandchildren and were well worth the investment. These handy devices are available just about everywhere, in every style imaginable, and in a wide variety of price ranges. They are designed to provide interest, beauty, and safety lighting in landscaping. Solar landscape lights will emit light all through the night, gradually growing dimmer as the night wears on. Accent or garden lights could be kept charging in the yard, but be brought inside the house for light during emergencies. 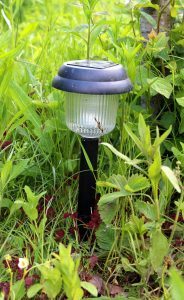 Solar powered motion sensor lights are worth considering. They can provide security lighting outside your home even when the power fails. ANKO sells a 1000 lumen Outdoor Solar Motion Sensor Security Light which provides 6-10 hours of non-continuous illumination on a single charge. DrawGreen produces a 1400 lumen Solar Security Flood Light which can provide light for up to 3 days on one charge. 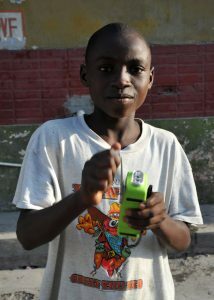 Many solar powered flashlights include other options such as an AM/FM radio, cell phone charger, or siren to call for help. These are just a few examples of a variety of flashlights that can be charged with the energy of the sun. ECEEN sells a 150 lumen Solar Powered Flashlight that will run for 4 hours on a single charge. If you want to use standard battery-powered lighting devices, consider purchasing rechargeable batteries and a solar charger. The initial investment can be a little bit painful, but the returns are great. Instead of throwing away all those disposable batteries, use rechargeable batteries and charge them using the free energy of the sun. The more expensive options tend to be much more versatile and a higher quality. They are all sustainable and could be quite valuable in an extended power outage. These are light sources that require some kind of human energy input for them to work. Frequently, you will find products which use solar power along with manual cranks to enable the device to function without sunlight. The combination lets you enjoy the best of both worlds. Manual devices can become annoying if the emergency lasts for any length of time. These are nice for general lighting. We have a 120 lumen AGPTEK lantern that we have been quite pleased with. It has multiple ways of charging including; hand crank, car charger, USB charger, polysilicon solar panels or 3 AA batteries. It will run for 12-20 hours on a single charge. FosPower makes an Emergency Solar Hand Crank Portable Radio LED Flashlight that is a valuable tool for your evacuation or survival kit. It will produce 20 lumens and run for approximately 6 hours on one charge according to the manufacturer. LifeLight sells a sturdy LED emergency car hand crank flashlight that has many valuable features. The lumens are not listed, but 30 seconds of cranking provides over 10 minutes of light. Shake flashlights are less common, but here are a few that we were able to find. HaveLight makes a waterproof shake flashlight. The lumens and run time are not listed. EcoCentricNow LLC sells a less expensive shake flashlight that puts out 25 lumens. It will run for 2 hours on a single charge. Perpetual light sources do not have a limited usable life. They will last close to forever. The sun is a perpetual and supreme light source. 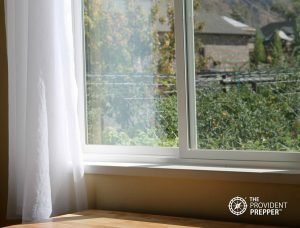 Natural lighting through windows is a type of perpetual light source. It is amazing and should be used whenever possible. Other than the sun, perpetual light sources tend to be dim, although their dependable, long life makes them worth exploring. Increase the natural light in your home by taking full advantage of sunlight from windows. Decorate using white or light colors to reflect the natural light that enters a room. Mirrors increase the natural light by reflecting it into different parts of the room. Light colors and mirrors will also increase the light from other sources (candles, lanterns, etc.). These light sources do not require batteries, bulbs, electricity, chemical activation, or fuels. There are no mechanical parts to fail and they are completely waterproof. UV Paqlites products are made from a high-quality glow-in-the-dark material called strontium aluminate. It absorbs photons and UV rays to charge, so it can charge in low-level indoor light conditions or by shining a flashlight on it for a few minutes. I took this photo in our pitch black food storage room. As you can see the UV Paqulite products actually give off an amazing amount of light for only being charged with ambient light. The mat provides enough light to safely navigate through the storage room, but not enough light to read by. The Mule Light is a 300-lumen flashlight combined with a forever glow stick to increase the life of a battery by over 60 times what you may expect from normal usage. The product I use the most often is a small reusable glow stick. I bought a few of them at an emergency preparedness expo and am quite pleased with the durability and design. Most Paqlite products are designed to be a functional light source and are not intended to replace the bright lights produced by lanterns or flashlights. 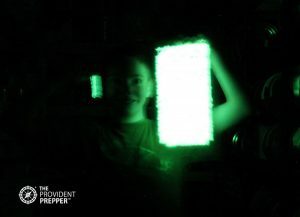 The amount of light emitted is similar to the light given off by glow sticks. UV Paqlites are a great addition to a survival pack and might prevent injuries from fumbling around in the dark. The fuels burned can be dangerous and must be stored carefully. Check out our post How to Safely Store Fuels for Emergencies to learn the best practices for emergency fuel storage. Remember to store matches, butane lighters, or some way to ignite the flame. It is also essential to keep a working smoke and carbon monoxide detector nearby. A fire extinguisher is always a good idea. There are many different forms of candles available. A candle lantern or chandelier may increase safety. Candles provide a soft, low light, and burn for a long period of time. Candles are easy to obtain and to store. The open flame presents a fire hazard and consumes a small amount of oxygen, to provide a little ventilation. Candles can produce a small amount of carbon monoxide. Check out the Safety Data Sheet on candles. Candles have an indefinite shelf life if stored in a dry, cool place. 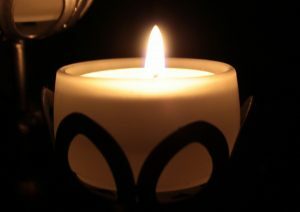 Never extinguish a candle with water, as this can actually increase the size of the flame and break any glass container the candle might be in. Do not blow on a candle to extinguish. The hot wax may accidentally be blown on surrounding surfaces or burn you. Always extinguish a candle by smothering. A “snuffer,” which robs the flame of oxygen, is often recommended, as it will safely extinguish the flame. If the candle is giving off smoke, extinguish and trim the wick to 1⁄4 inch. The candle is smokeless, odorless and has no hot wax to make a mess. It produces only a soft light from a small flame. Not really enough to read by, but may be quite comforting when the power is out. Traditional oil lamps or lanterns put out more light than candles. The flame is usually surrounded by glass, which is a nice safety feature. Many are designed to set on a table or to be hung for greater distribution of light. Practice using the lamps at dinner to create a cozy atmosphere. Oil lamps can add beauty to the home decor. Oil lamp wicks should be kept trimmed to burn cleaner and provide the best light. Be sure to store fuel, wicks, and matches for these light sources. Now let us review the common fuels for oil lamps, each of which may produce some carbon monoxide as a byproduct of combustion. Oil lamps should always be burned in a well-ventilated area. Liquid paraffin is great for use in liquid lamps. It is smokeless, odorless, cleaner than kerosene, and slow burning. It can be used in traditional oil lamps and wick oil candles. The flame should be restricted to a half inch for safety purposes. Liquid paraffin is fairly safe and has a long storage life. One quart will provide roughly 200 hours of light. The Safety Data Sheet for liquid paraffin is a good place to learn about recommended storage requirements and byproducts of combustion. Lamp oil is a liquid petroleum product for lanterns and will produce less soot, smoke, and other pollutants. It is a relative of kerosene. Store at, or near, room temperature. Do not allow to freeze. Lamp oil may explode if it thaws too quickly. For details review the Safety Data Sheet on lamp oil. Depending on wick size and lamp, one quart might provide up to 75 hours of burn time. A kerosene lantern with a one-inch wide wick will burn approximately 45 hours per quart of kerosene. A kerosene lantern uses one fourth as much fuel as a gas lantern. The light is comparable to a 40W-60W light bulb. Ensure proper ventilation when using indoors as kerosene produces carbon monoxide and other toxins along with some black smoke as it burns. The smoke can be minimized by lighting outside and then bringing indoors. Gas lanterns are designed to be used outdoors only. They produce a nice bright light. The fuel produces carbon monoxide, so while they are great for outdoor use, plan alternative lighting for indoors. Propane lanterns produce a very bright light. They perform well in windy and wet weather. These lanterns require both fuel and mantles. Candles will not burn without a wick, gas lanterns must have a mantle to burn. The mantles are fragile. It would be a good idea to store several extra. This is a good old camping favorite. The light is adjustable, quite bright, and gives off a fair amount of heat. Liquid fuel lanterns are designed to be powered by specific fuels. Kerosene, Coleman or white gas, or unleaded gasoline may be used depending on the model. Use only the fuel recommended for your specific model. Dual fuel models are specifically designed to accommodate two fuels. Never use white gas or unleaded gasoline indoors. They produce much more carbon monoxide and must have adequate ventilation. Burn time varies by lantern and fuel type. Calculate your needs based on your specific lantern and fuel choice. Do not store lanterns full of fuel. It can damage the appliance. Are You Ready for Lights Out? Light elevates your mood and increases productivity. Fears and worries are magnified in the dark. Life looks better in the morning because of the light. We encourage you to study your lighting options and plan to keep your family safe, and in the light, during power outages. Carefully consider the dynamics of the people living in your home. Should open flame be an option? Would burning fuel indoors compromise the health of the elderly, young or infirm? Darkness is depressing. It can be dangerous to fumble around in the dark, as even a minor injury during a disaster may prove to be life-threatening. 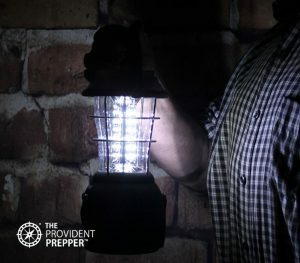 A little bit of advanced planning and stocking up can keep you safe in the light during a disaster. We have established that light is vital to emotional well-being and physical safety during a power outage. You do not need to have every cool lighting device available, but you want to meet your basic needs. What hazards are you preparing for? How long do you need to provide light without electricity? What type of lighting needs do you have? 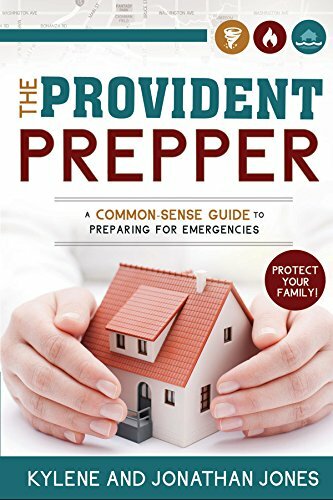 Do you need to take special precautions for members of the household? We have children in the home, so we prefer to avoid open flame when possible. Each of our children has their own light sticks and flashlights. We have short-term emergency devices (flashlights, headlamps, candles, etc.) as well as long-term sustainable methods (natural lighting, solar lights, reusable glow lights, etc.). It sounds like a lot, but it is not. We use many of these devices in our everyday life. We prepared a worksheet to help you get started on your action plan. It is a good way to brainstorm your emergency lighting needs. Where will you be when the lights go out? With a little planning, you won’t be in the dark.